Hello friend. Good article, thanks. a) I think in CY and PMB, the Empress represents the Empire, as always, but may be in secondary meaning represented Bianca Maria (I'm working on this hypothesis). b) The ladies of the courtship of Bianca Maria wore green suits. It seems that was one of his favorite colors. Yes, Bianca as secondary, Empire as primary. Green also appears in the seven other cards in the PMB, and only those (viewtopic.php?f=23&t=395&start=20#p7959). It means something. Anything of relevance to tarot in your Dracula article? It looks great, by the way, something I'll read. OK, now for something I'm sure people will disagree with. Along with Isis, perhaps by the end of the century, there would also also Venus with Cupid, who like Jesus represented the spirit of love. 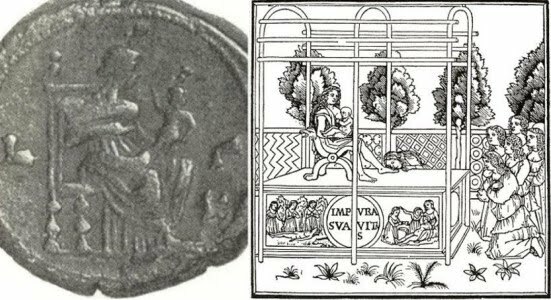 Below left is Isis with Horus, on a Roman coin, of which there would have been many in Italy of this time; the hawk was Horus’s bird, corresponding to the eagle further north. On the right is Venus and Cupid, from the 1499 Hypnerotomachia. (This book also has the rather Popess-looking Priestess of Venus. See my post at viewtopic.php?f=23&t=385&start=40#p8626). By such associations, the Empress card becomes larger than the Empire. As the imperial bird of Zeus, the eagle was credited with virtues that Plutarch, in De Iside et Osiride, had ascribed originally to the falcon, the symbol of Horus and Osiris: 'This bird,' he said, 'is distinguished by the sharpness of its vision and the speed of its wings' (footnote: De Isis et Osiris LI). Ripa said the same of the eagle: 'havendo egli (sil. l'aquila) la vista acutisssima e il volo di gan lunga superiore a gl' altri animali volatili', (Footnote: Iconologia, s.v. ingegno), an argument borrowed from Piero Valeriano who, although committed by the Egyptian character of his Hieroglyphica to retain these attributes for the falcon (footnote: Hieroglyphica XXI fol. 155v), was sufficiently generous and inconstant to ascribe them to the eagle as well. (Footnote: ibid. XIX, fol. 141v, s.v. 'ingenium velox', on the authority of Pindar, Nemean Odes iii, 80f. Wind cites the Latin of Xylander's and Calcagnini's translations, printed too late even for the Cary Sheet. However the Greek Plutarch was readily available, and even, after 1400, Latin translations in manuscript (Curran, The Egyptian Renaissance: The Afterlife of Ancient Egypt in Early Modern Italy, p. 22). In post-1450 Milan, the poet/scholar Filelfo could easily have had both. Given the intense interest in Egypt by his Florentine humanist circle, it would be surprising if he did not have at least one. Then there is the question of the inference from falcon or hawk to Horus. "Falcon" and "hawk" are equivalent; some translators use one, some the other. Boas' English translation of Horapollo never uses the word "falcon"; neither does the translators of Plutarch. What about the association between the hawk/falcon and Horus. Wind simply asserts that the bird stands for Horus. It did, in Greco-Roman Egypt, but did the Renaissance know that? Plutarch (LI) associates the hawk to Osiris, not Horus. But given the reference to "the eye of Horus" in LII, the eye being a major attribute of the hawk, that bird would likely have been associated to Horus as well as to Osiris. It is the royal succession that matters, the dynasty of Osiris, with Horus as his heir-apparent. Horapollo, another authority that Filelfo almost certainly had (see later in this post) says the hawk can represent any Egyptian god (Boas trans, p. 45, in Google Books)--and also, interestingly the soul (grounds for another interpretation of the shield!). Because of the child, the association is to the goddess herself, and not some priestess impersonating or her or with special access to her favors. As for Rhea, she was not shown in classical or Renaissance art with the infant savior Zeus on her lap; the scene would have been too pathetic, since she was going to have him raised far away. The back of the chair, in both the Cary Sheet and the Noblet (at the top of this post, on the right), suggest wings; Isis took the form of a bird, the kite. I do not know whether this identification was known at the time or not; I can't find it in Plutarch or Diodorus. There is Leonardo's childhood memory, in his diary, of being attacked by a kite ("nibbio," notoriously once mistranslated as "vulture") in his crib; but whether the bird's relationship to Isis was known, I don't know. Freud's analysis of the memory as a maternal image, despite the mistranslation, may not be off the mark. The vulture clearly was seen as a maternal image during this time, and the kite is just a particular kind of small vulture, which eats small live animals as well as carrion. She is naked, to denote the Principle of Nature, that is active or Form, and passive or Matter. The turgid Breasts denote the Form, because it maintains created Things; the Vultur, a ravenous Fowl, the Matter; which being alter'd and moved by the Form, destroys all corruptible Bodies. If this vulture "destroys all corruptible bodies," it is hardly "nature's fecundity, and maternity." If Blasius in 1681 has the vulture again at her side,t hat is probably to represent the destructive side of nature, as in Ripa. His image, showing the bursting breasts and the vulture, is below. There is a certain comparability in composition to the Empress card, to be discussed later. Hadot's reference to Horapollo is more appropriate. In that highly influential text the vulture is the maternal power, although he says that it is a power from the heavens and nowhere says it is nature. That particular attribution is reported by another ancient authority on hieroglyphics that surfaced in Italy around the same time as the Horapollo, Ammianus (quoted in appendix to Boas translation of Horapollo, in Google books, p. 103). Interestingly, I do not find it it any other ancient source. Yet the architect Leon Battista Alberti repeats it, in a famous passage, published 1486, that I have discussed more fully elsewhere (http://www.tarotforum.net/showpost.php? ... stcount=44). It begins: "The Egyptians employed the following sign language: a god was represented by an eye, nature by a vulture..." So he must have known this text, still in Greek at that time--not implausible, given his residence in Florence during the 1430s, when this text was being discussed there. 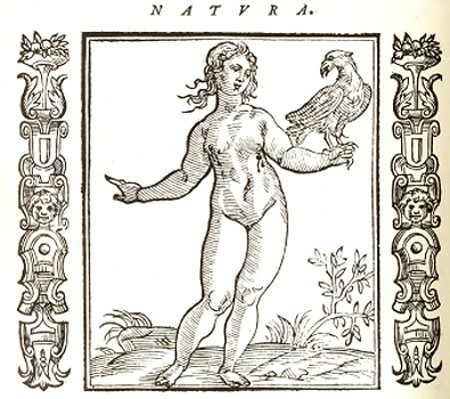 The famous 1499 fantasy, the Hypnerotomania, also implies that a vulture represented nature, in its translation of a "hieroglyphic" inscription that Porphilo sees. It shows, and also says that it shows, for its second image, an altar with 'on its face, the images of an eye and a vulture" (c1; Godwin translation, p. 41). The second phrase of the "translation" reads "...to the god of nature..". So clearly eye = god and vulture = nature, as the commentators on this point have recognized. as the So now there is a precedent for vulture as nature in the emblem tradition. We also have to wonder how the author of the [Hypnerotomania happened to read a book on architecture. Some have suggested Alberti as the author, or one author, of the Hypnerotomania. But it is perhaps not surprising that the author of a largely architectural fantasy would have noticed this passage in a book on architecture; it was quite famous in its time, the first of its kind since ancient times. This is a topic for further investigation, but not here. Fortunately, to explain the apparent wings on the Empress, we only need for her to be maternal and a largish bird. Could Harapollo's Hiroglyphica have influenced the Cary Sheet card. One might think that since it was not published until 1505 and not published in Latin until 1585, the answer would be negative. However there was a Latin abridgement, which some scholars think was done by the early 1430's. Moreover, the architect Filarete, writing an architectural treatise for Francesco in Milan during the 1450's, refers to a text that numbers eels among the animals depicted in Egyptian hieroglyphs. Harapollo is the only ancient authority who talks about the meaning of an eel-hieroglyph. Filarete said in the book that he got the information from his friend Filelfo. Filelfo was indeed one of a group of humanists to whom the Greek text was readily accessible, through the right associations with the right scholars and through knowing Greek. ( All this is discussed in detail by Brian Curran in Egyptian Renaissance: p. 36 for Ammianus, p. 104 for the Latin abridgement of Horapollo, and p. 85 for Filarete.) So it is not out of the question that the vulture would be an association to the card. It is one of many possible Egyptianate features in the Cary Sheet cards. It appears that I could add Diana/Artemis to my list of goddesses associated to the Empress card, although I think that association is weak compared to Isis: Artemis was impersonal nature, whereas Isis has her personal side, the mother of a particular savior-child. Moreover, I can't think of how Artemis would fit into a narrative involving a large number of the trumps. I can for Isis. Another addition might be Semele, mother of Dionysus, although she didn't have a child on her lap either. She was dim-witted enough to think that she could see Jupiter as he really was. The closest she got to her child was feeling it in her womb. She burned to a cinder, while Hermes rescued the foetal Dionysus. The Noblet Empress, with her half-open eyes (above right), conveys that cluelessness well. But at least she conceived Dionysus. This association makes the card part of a narrative about Dionysus, addressed in all or many of the cards, supplementing the primary narrative, which is Christian. As Empress, Bianca Maria Sforza was a kind of real-life Semele, minus any children that we know about. Stuck in freezing Innsbrook after inopportunely aiding her grandiose uncle, she hardly ever saw her husband. All there was for her to do was spend money, of which she never had enough (Gerhard Benecke, Maximilian I, an analytical biography). She died childless at age 38. The next empress, too, didn’t see her husband much. He was off fighting the Protestants. She had plenty of money, thanks to the Aztecs and the Incas. She nominally ruled when Charles was away, but was actually just a figurehead (The world of Emperor Charles V, ed. Blockmans and Mout). She died in childbirth, too, at age 36; but she had six children to show for herself. Following her descendants, we eventually get to Marie Antoinette, another numbskull. What matters in the Empress is her ability to produce a savior-child, the image of his father, who is the Father himself or his earthly equivalent by divine dispensation. She is the vehicle of the Pythagorean Triad, the child of the form-father (either the Bateleur, as Monad, or the Emperor, as father) and matter-mother (the Popess Dyad become Empress). We see that child in the Sola-Busca Three of Coins and Three of Batons (viewtopic.php?f=12&t=530&start=10#p7946; it and the previous spost there, on the Twos, also contain the relevant quotes from the Neopythagorean Theology of Arithmetic). 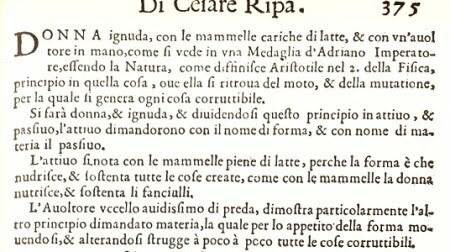 In this respect there is a certain parallelism between the Ripa Natura and the compositionally somewhat comparable Empress card. Both nature and the child (individual representatives of kinds, in Aristotle, the Triad in the Theology and 3 in the cards) are the product of form (in Aristotle, corresponding to the Monad, 1 in the cards) and matter (in Aristotle, corresponding to the Dyad, 2 in the cards). 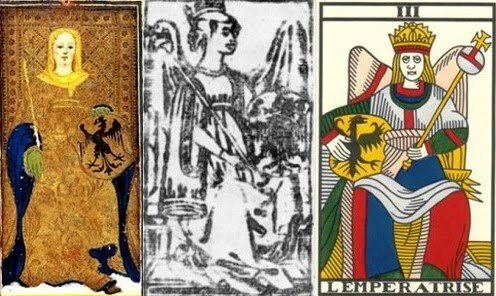 By 16th-early 17th century, to humanists interested in Kabbalah, the Empress might also have been associated with the third sefira of the Kabbalah. The sefiroth were in these years called “enumerations,” i.e. numbers. (They may even have originated in the same milieu as Neopythagoreanism, Roman-era Alexandria.) So the sefiroth would have been closely identified with the Neopythagorean teachings about the first ten numbers (plus zero, which they hadn’t written about, but which has a Kabbalist correlate in the Ayn Sof). Pico, in the 900 Theses (1486), called this sefira “the source of all souls” (28.6); “the river that flows from Eden” (28.11); and “the antecedence to form” (11>31). To these, Reuchlin (1518) added “providence” and “mother of sons.” These are to be sure just a few of many descriptors of this sefira in the Christian Kabbalist works of the late 15th and early 16th century. In the Conver 1760, the Empress’s image improves slightly over that in the Noblet. At least she has her eyes open, perhaps looking sideways at her husband—or at her advisers, in case he is away. We can perhaps imagine this one as the protector of the sick and weak, sponsor of hospitals, server of “cake” (which I understand was something like brewer's yeast, not a bad idea), etc., and so a true representative of divine providence. I suppose that the tarot-makers couldn’t risk having the King’s tax-collectors close them down. In 1760, we are in the last days of the Kingdom of France. Vive la République, etc. The Empire won’t be far behind. Note: I edited this post on Sept. 4 to add my comments about Ripa and Horapollo. Edited again on Sept. 5, 2010, to add Ripa scans and my discussion of Wind on falcons and eagles. Edited again on Sept. 6, correcting the discussion of Wind and adding discussion of Alberti and the Hypnerotomania on vultures. I do not think that green in itself implies Bianca Maria, even if it was her favorite color (I have also heard that she favored red): green was already a symbol of fertility, as attested by the song "greensleeves" and the association of green with spring and spring with love. Also, the suit of staves probably has an association with fertility, as a phallic symbol and as what grows in the spring. All of the Staves court figures have green gloves or sleeves. However the green glove does associate the PMB Empress with the female lover on the PMB Love card. If the latter is Bianca, that suggests the former as well. But it is the combination of two emblems on the PMB Empress's gown that suggests most strongly that she is Bianca Maria. The three interlaced rings are a Sforza device (whoever else may have had it), even if it is not totally clear how or when that family acquired it. It is not personal to Frencesco, however, since Alessandro and his son Constanzo Sforza had it, too. Dummmett says in Il Mondo e l'Angelo (1993) that it was acauired by Muzio Attendola Sforza, Francesco and Alexxandro's father. Cecilia Ady in her book on the history of the Sforza in Milan said it was acquired in 1409, given to him by Niccolo d'Este in gratitude for his "victory" (successful ambush of a truce) against the then-lord of Parma (cited by SteveM at viewtopic.php?f=11&t=1154&p=18845). The other emblem is the crown with a frond on each side, one of palm and the other of laurel. This same emblem is on the Tarot de Marseille Ace of Swords, clearly descended from its use in Miln. It can be traced back at least to Filippo Maria Visconti, as an emblem of his rule over the Duchy of Milan (see posts 3 and 4 of the Aeclectic thread at http://www.tarotforum.net/showthread.php?t=227314). The Empress holds a shield bearing the imperial eagle; on her gold dalmatic are the ducal crown with the fronds of laurel and palm, and the three interlaced rings which constitute a haraldic device specific to Francesco Sforza. The joint presence of these two emblems together provides the incontestable proof that the pack was painted after 1450, the year Francesco made good his claim to the title of duke; before that, he would not have dared to combine them, while, of course, Filippo Maria Visconti, who refused to nominate Francesco as his successor, would have had no reason to do so. The combination of emblems suggest rather strongly that this Empress, if not a certain duchess, is at least being presented with all the trappings of such. Her crown, moreover, is not that worn in portraits of the the 15th century empresses (see https://en.wikipedia.org/wiki/List_of_H ... _Empresses), but in so far as duchesses of Milan were depicted with a crown, (https://en.wikipedia.org/wiki/List_of_Milanese_consorts) I only see one Visconti with a crown, Caterina Visconti as a Modonna of Humility, in one much like that of the PMB Empress. So again, yes, Bianca Maria as a secondary meaning. She would have been 25-35 at that time, about right for the face on the card, too, but probably, judging from the portraits of her done in the 1460s (I think), with a fuller face, probably in the lower half of that range. However the face is also rather similar to that of the CY Empress, which still seems to me could be that of Barabara of Cilli. Yet the face of the CY female lover and the charioteer resemble the CY Empress. Given that the male lover has a Sforza emblem on his chest (the fountain), it may well be that the CY Empress, too, is Bianca Maria. That would make sense only as a supreme act of deception on the part of Filippo Maria Visconti, if he was the commissioner of the deck and wanted to create a certain impression, as he surely would not have countenanced a commoner like Francesco Sforza as Duke. That would make sense only as a supreme act of deception on the part of Filippo Maria Visconti,... as he surely would not have countenanced a commoner like Francesco Sforza as Duke. Of course that possibility would never have entered his mind, since he never intended the Duchy to go to his daughter's husband. Sforza had no claim, not by marriage, and not by decree of the dying Duke. He changed his mind about the succession a few times, since he had no male heirs - the law of male succession only, decreed by his father Giangaleazzo, was never changed (although GG himself allowed for a line through his female offspring, since it included a provision that if his own male descendants failed of an heir, it would be his daughter Valentina's male offspring that would inherit Milan. The best sense I can make of this is that he intended to keep Milan close to France). If I remember correctly, Filippo Maria's last decision was to pass it to Alfonso of Aragon.